Before we get to the meat of today's very fleshy article, I just wanted to take the time out to let you know that I will be attending Paizocon 2015! Whether you're a long-time fan of the Encounter Table or just discovering it I'd be happy to meet with you and talk Pathfinder, I'm always interested in meeting new people, exchanging ideas, and making new connections! Today's Pop Creature update brings to life the nightmarish antagonist of Dragon Age: Inquisition, the Elder One Corypheus. In this article you'll find everything you need to create a memorable villain like Corypheus in your own Pathfinder game. 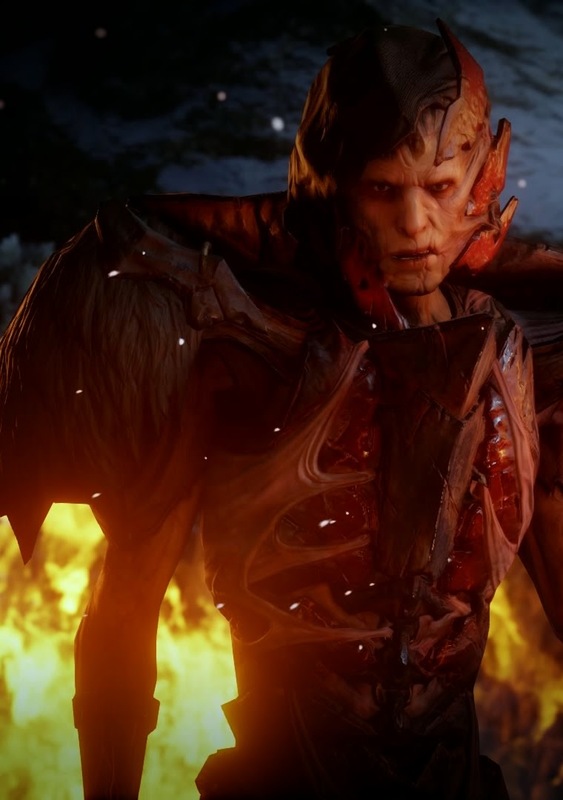 The Dragon Age video game series has popped up on the Encounter Table once before, but with the release of the stupendous Dragon Age: Inquisition it's high time to tap that well again. The fleshwarped elder is a spin on the legacy of the corrupt darkspawn magisters from Dragon Age and are created with a tie-in to the broader lore of Golarion. Where the fleshwarped elders come from, how they were created, and what terrible plans they have are up to you as a GM. If you use this creature in your Pathfinder game, let us know how it went and what dread plans they're enacting! Init +4; Senses Perception +21; sense fleshwarped 190 ft.
Before Combat Athzurkal casts air walk, freedom of movement, greater magic weapon, and magic vestment. During Combat Athzurkal uses melee attacks and channeled energy against close opponents. Against ranged opponents, he uses spells to divide, blind, and kill. If faced by multiple, powerful opponents he will call for his soul refuge Kherzikia to join the battle, but will flee if Kherzikia is reduced to less than half his total hp. Without greater magic weapon and magic vestment, Athzurkal's statistics are AC 28, touch 14, flat-footed 28; Melee +1 spiked chain +23/+18/+13 (2d4+10/19–20). An old or older lunar dragon's breath weapon can affect creatures immune to cold damage. A creature immune to cold damage still takes half damage from the breath weapon (no damage with a successful saving throw). Resistant creatures' cold resistance is treated as 10 less than normal. A lunar dragon's alien presence affects opponents that fail their saves as touch of idiocy (or as feeblemind for creatures with 4 or fewer Hit Dice) for 5d6 rounds. This is a mind-affecting compulsion effect. A creature that fails its saving throw against a lunar dragon's breath weapon emits light (as faerie fire) and is dazzled for 1d4 rounds. If the lunar dragon is adult or older, the creature is also confused for 1d4 rounds. A lunar dragon's natural weapons are treated as silver for the purpose of overcoming damage reduction. Rays and ranged touch effects that strike an ancient or older lunar dragon but fail to overcome its spell resistance are reflected back at their source, using the original attack roll to determine whether they hit. A very young or older lunar dragon can't be blinded or dazzled by bright light or patterns. "I have seen the throne of heaven, and it is empty!" The practice of fleshwarping exists both on and below the surface of Golarion. From the flesh-forges of Ecanus in the nation of Nex, to the punishment-come-art of the Drow houses of Sekamina. The origins of fleshwarping, however, are long lost in the shadows of cataclysm brought about by Earthfall and the Age of Darkness. Terrible creatures of unfathomable horror were forged in the primordeal ages before Earthfall, most of which perished in the collapse of their ancient civilizations, but some nightmarish creatures escaped the fate of millions of others swallowed in ash and flame, hiding in the dark corners of the world to await the time of their return. Fleshwarped elders are creatures not known in the current age, monstrous entities forged by either accident or insane design long before the fall of empires like Azlant and Thassilon. Were they merely more powerful versions of known fleshwarped they would be terrible enough, but fleshwarped elders possess strange abilities allowing them to both escape death and control the minds of other fleshwarped creatures. The process to create fleshwarped elders is lost to the modern era and may even have been a unique confluence of circumstance or fate that created the first—and last—of their kind. “Fleshwarped Elder” is an acquired template that can be added to any corporeal creature (referred to hereafter as the base creature). A fleshwarped elder retains all the base creature's statistics and special abilities except as noted here. Size: A fleshwarped elder's size increases by one category. Type: The creature's type changes to aberration and gains the augmented subtype. Do not recalculate BAB, saves, or skill ranks. Senses: A fleshwarped elder gains darkvision 60 ft.
Armor Class: Natural armor improved by +6. Hit Dice: Change all of the creature's racial Hit Dice to d8s. All Hit Dice derived from class levels remain unchanged. Melee: A fleshwarped elder gains 2 claw attacks. Count the fleshwarped elder's size as one category larger (after increase from this template) when determining damage. A fleshwarped elder can assume control of a number of hit dice of fleshwarped creatures equal to four times its own HD. This functions as control undead but only on fleshwarped creatures. Once control is established, the fleshwarped elder maintains control and may communicate telepathically with its servants at any distance. The DC to resist fleshmaster is 10 + 1/2 the fleshwarped elder's HD + the fleshwarped elder's Charisma modifier. A fleshwarped elder may telepathically communicate with any fleshwarped creature within 1 mile, however if the fleshwarped elder does not have line of sight this telepathy is only one-way. When a fleshwarper elder is slain while its soul refuge lives a fragment of its spirit immediately transfers into the body of nearest fleshwarped creature (on the same plane of existance) to its soul refuge, unless the target of rejuvenation succeeds at a Will save (DC 10 + 1/2 the fleshwarped elder's HD + the fleshwarped elder's Charisma modifier). A successful save prevents that fleshwarped from becoming the target of that fleshwarped elder's rejuvenation ability for 24 hours and the fleshwarped elder's spirit moves on to the next nearest available host. If no hosts are available the fleshwarped elder's spirit becomes inert and resides dormant within its soul refuge until an appropriate host becomes available. During this time the fleshwarped elder is unaware of its surroundings or the passage of time. Once a fleshwarped elder possesses an eligible host, it may remain dormant for up to 1 day per HD of host at the end of which it automatically rejuvenates. At any time while dormant the fleshwarped elder may telepathically communicate with its host (and only its host) and attempt to exert control with its fleshmaster ability, but may take no other actions. While dormant any divinations targeting the fleshwarped elder instead affect its current host (though detect thoughts reveals the presence of a second thinking mind inside of the host.) The fleshwarped elder may choose to rejuvenate as a full-round action at any time while dormant, destroying the host's body and killing it as the fleshwarped elder's form claws its way out from the inside. The fleshwarped elder is immediately restored to full hit-points and cured of adverse afflictions as if affected by heal. A fleshwarped elder is aware of any fleshwarped creature within 100 feet per HD and can sense their general distance and direction. This ability allows a fleshwarped elder to pinpoint the exact location of a hidden or invisible fleshwarped creature within 30 feet. A fleshwarped elder's soul is no longer tethered to its corporeal form. As part of a special ritual that takes 1 day per HD of the fleshwarped elder, it may safeguard its soul inside of another fleshwarped creature (either creatures such as drider and halsora, or creatures with the fleshwarped template but not another fleshwarped elder) hereafter referred to as the soul refuge. This creature chosen to become a soul refuge must be willing, or under the effect of the fleshwarped elder's fleshmaster ability, for the duration of the ritual. At the end of the ritual the fleshwarped elder's soul is housed safely inside of the soul refuge and the fleshwarped elder becomes immune to energy drain as well as any spell or ability that specifically targets its soul (such as trap the soul or soul bind). Likewise, the fleshwarped elder's soul cannot be targeted while inside of the soul refuge as it is protected by the soul of the host. While the soul refuge lives the fleshwarped elder may benefit from its rejuvenation ability (see below). The fleshwarped elder may also share its senses with its soul refuge as a move action, gaining access to all of its soul refuge's senses. While sharing senses with its soul refuge, the fleshwarped elder is considered helpless. The fleshwarped elder may end its shared senses as a free action on its turn. Both the fleshwarped elder and the soul refuge always knows the exact direction and distance of one another and share the benefit of a permanent death watch. If a fleshwarped elder's soul refuge is slain it immediately takes 10d6 points of damage and loses the benefit of its rejuvenation ability. Awesome Game article..thank for your sharing..